Caversham Wildlife Park is about a half hour’s drive from Perth and even on a blisteringly hot 40 degree day like today, well worth a visit. 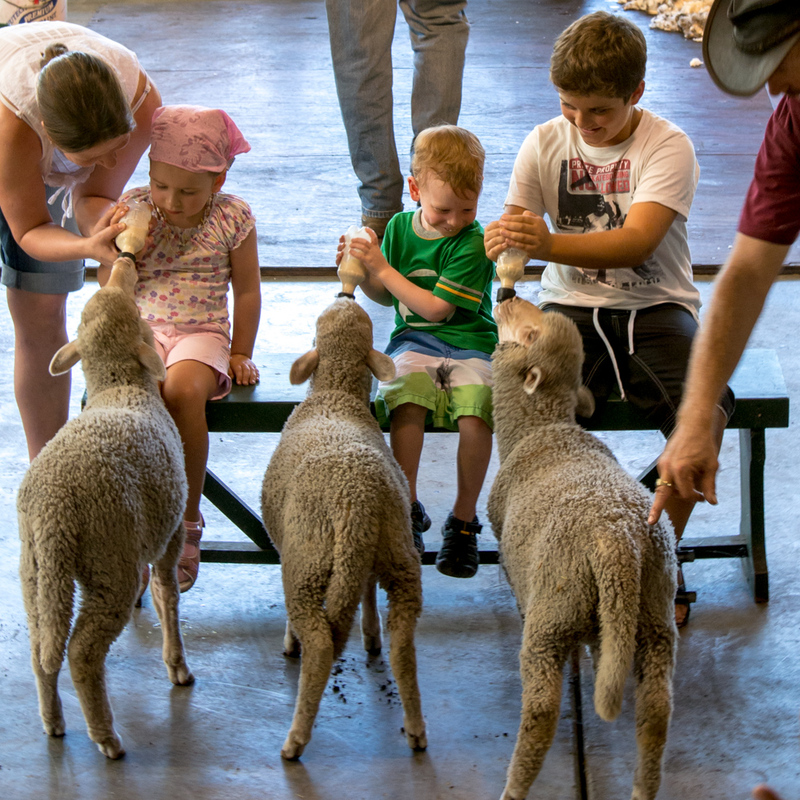 We arrived at about 10 am and headed straight for the farm show that demonstrated sheep herding, sheep sheering, and even, with the help of Rowan, his best Perth friend P and another little girl from the audience, how to bottle feed lambs. Next it was how to milk a cow, which Rowan also enjoyed doing tremendously. After the show we walked the winding paths around the park, hugging the trees and bushes for shade and venturing onto some of the smaller paths leading to the Kookaburras, Cockatoos and Cassowaries (which Kevin insists look like dinosaurs…) on our way to the kangaroo walkabout. 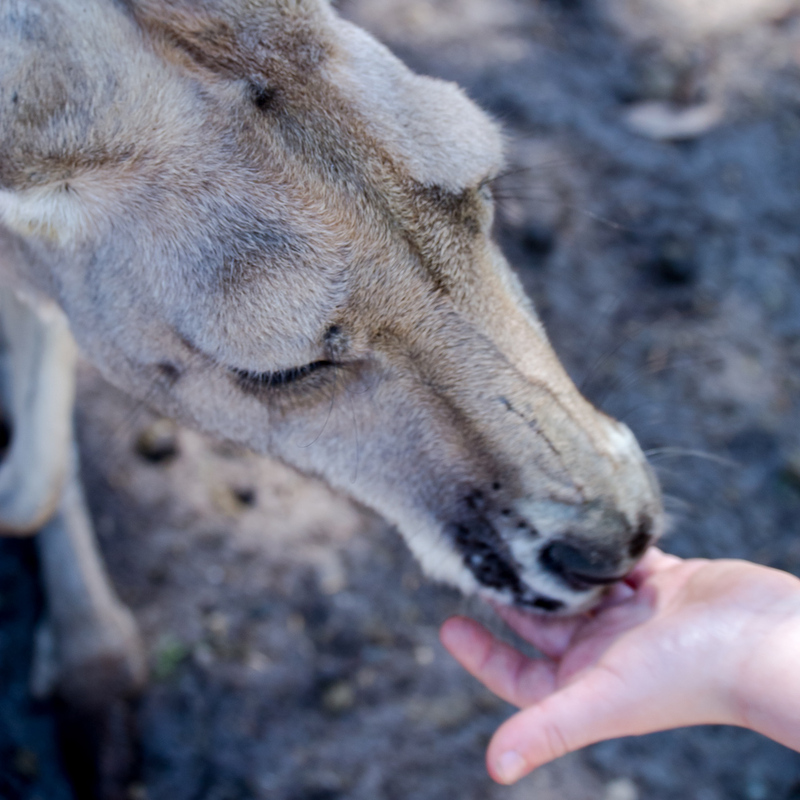 Most of the kangaroos were sleeping, but didn’t mind being petted or told how sweet they are. Rowan stepped gingerly between them and went from one kangaroo to the next, saying, alternately, “oh, he’s so cute,” and “oh, he’s so soft” as he stroked their backs or the fur between their long, adorable ears. When we found the kangaroo food, Rowan was in heaven. He offered each kangaroo one pellet with his fingers and every one of them were quite delicate when they accepted the gifts with their long teeth and thin lips. More cries of “oh, he’s so cute” followed and we spent more than half an hour during the hottest part of the day wandering among these slumbering Australian icons, admiring their soft fur and even gentler dispositions. Next it was onto the koala enclosure. When we arrived there were no other tourists, so we had several minutes alone with the koala we were allowed to pet with the back of our hand. He slept through the encounter, but we were starstruck. Koalas’ fur is long so it feels as if you are touching an extremely soft but high pile carpet. We were only allowed to touch one koala, but look at and fawn over about five others clinging to the Eucalyptus tree branches in the covered, open air and gated enclosure. Then it was time for a snack and a quick splash in the nearby wading pool before heading back to Perth. On the way we stopped off at a farmer’s market for several kilos of fresh fruit to take home and enjoy after lunch and maybe a dip in the pool. Then it’s off to the beach for some more swimming. It’s really all you want to do on hot Perth days like this. What an absolutely incredible experience you are giving your son. Hi Eva, He is having a blast and we hope he remembers some of it. If not, no worries, we know this trip has impacted him as a human being. We’ve watched him grow right before our eyes. Thanks for sharing this. What a wonderful experience for your family! Hi Donna, Yes! Travelling as a family to out-of-the-way places helps you connect in a completely different way. You all get to experience new sights, sounds, tastes, and feelings – together. You share the wonderful ones as well as the frustrating ones and you really get to know the depths of each other along the way – how you all feel when you see baby sea turtles released into the sea in Borneo, or what your reactions are when you get stranded in Kuala Lumpur’s airport at 3am. Every minute is an adventure. It’s an amazing way to live in the moment with the people you love most in the world – even if just for a few short weeks.